Don't miss a single episode. Artists he’s tour and /or records with include John York, Ronnie Milsap and Charlie Rich, Freebo and Bonnie Raitt, James Lee Stanley, Chris Hillman, The Burrito Brothers, Janis Ian, Ezra Mohawk and others. Some of the things I talk about with Chad include: Playing at one of my favorite venues, Kulak’s Woodshed in North Hollywood with Freebo who used to be Bonnie Raitt’s bass player, and the Kulak’s Woodshed archives, which have been relocated to their Youtube channel, where you can still see live performances from some of the performers mentioned in our conversation. He also takes about his days on the road with Ronnie Milsap; A brush with Kim Fowley, reminisces about some of the old clubs like the Palomino and a missed opportunity to sit in with Stuff, the original house band from Saturday night live when we swapped stories about missed opportunities. I mentioned the I chickened out when Marty Rifkin invited me to sit in with the house jam at the Palomino. And then there’s great tale about country star Dale Watson – sorry, no spoilers. Chad is currently working on a few recording projects and has just wrapped up a project with James Lee Stanley. 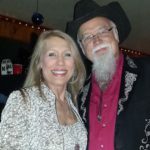 He continues to perform live with his lovely wife, Pam Loe. Hi Hal – very nice post about Chad Watson. It was an interesting read. I’m not familiar with all of the artists that you mentioned, but my favorite is Bonnie Raitt. Very cool that he played with Freebo at Kulak’s Woodshed. And what a missed opportunity on not sitting in with Stuff from Saturday Night Live. Thank you, Michele… yes, we all have our moments. Sometimes we shine, other times, we get shined on. This is actually inspirational I love the performances at the kulaks woodshed archive. it was amazing how I watched a lot of talent been displayed and they lived as a family playing good music and having fun. I love his charisma,he his indeed a survivor. Can’t wait to hear the recordings with James Lee. If you’re serious about hearing the recordings with James Lee Stanley, check out James’s website. Chad played bass on the Wood and Doors 2 album and also on the soon to be released Wood and Led. These are all acoustic versions of Doors songs (or Led Zeppelin), respectively. Thanks, Seun! I recently spoke with James Lee Stanley about his performing with Peter Tork of the Monkees. I just uploaded the entire Peter Tork Tribute earlier today. Check it out when you have a chance, there is a link to their performance on the show page. Do you know Chad Watson personally? How did you approach him to do your podcast? That’s awesome 🙂 I love your podcast by the way. He sounds like an amazing guy, would love to hear him play live. Does he come to NYC? Love when he said I stay in the same pool and outlived the competition lol I need to adapt that into my life. He is a funny guy. Yes, I know Chad…. I’m not sure when Chad will be in New York. These days, he spends .kst of his time in recording studios working with several artists. He plays live locally in the L. A. area clubs with a couple different bands. Yes, I’ve known Chad a very long time. But I find that most people that I have asked to do my podcast said “yes” – even the ones I didn’t know very well. It seem to me that more people e are willing to share their stories than we think. All you can do is ask nicely . The worst they can say is no. ANd if they do, maybe ask agin another da. Maybe they’l change their mind. I just took a look around your website. It’s an interesting site, and I listened to your podcast with Chad Watson. I then read the “About” section – you have had an interesting career! Your Road Warrior Tales – I can tell it is a passion of yours. You are giving an opportunity to put a person behind the mike in front of a different audience, and get to know them as a person. Am I right in that assessment? Everybody has story to tell, some tell it better than others. I found a place where I can get myself a mike and a desire to do a podcast. That was part of my purpose in writing to you. I’m learning to set up a website now. Would you be open to giving me some pointers on the webcast setup? I will be happy to help you get started. I’ll message you privately when I have a chance.